Nintendo's outstanding SNES effort, Super Mario Kart, led to the creation of a kart racing genre that, for good or bad, has infiltrated every console since. No matter the competition, though, Mario always brings the goods, and Mario Kart 7 is no exception. I recently had a chance to check out this latest edition and came away impressed. Feel free to dive right in. Each system was set up with a four-race tournament that showed off the different vehicles and environments. I selected none other than Luigi, the scrappy brother of the spotlight-hogging Mario, and was met with a few vehicle options. You're able to choose from your own shell, but there were others you could select, like Yoshi's mega-egg kart. You could also choose the type of glider (more on that later) as well as the size of the wheels, each of which have their own set of attributes that you'll learn about after a few races. I kept it safe by choosing the stock Luigi car and quickly hit the track, and after a few minutes, enjoyed the typical Mario Kart experience almost everyone knows and loves. The action is fast, items like red shells and banana peels are plentiful and the competition is no joke. Just like previous Mario Karts, the game balances things out through the power-up system. If you're behind the pack, the chances of picking up a great item like a race-changing Lightning Bolt or an invincibility Star is a lot greater than when you are in first. Take the lead, and you'll need to watch out for the ominous blue homing shell. Customize your karts to create mini monster trucks. Going through a few more of the tracks, I encountered features that are fairly new to the Mario Kart series. 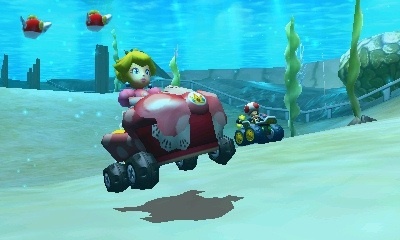 One of the tracks came with an underwater segment, with the karts converting into small submersibles. 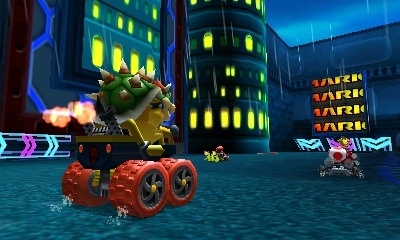 Controls are the same, but the weight of each kart and how it handles the terrain is a bit floaty. Another track takes place within Donkey Kong's jungle, and has a lot of jumps. This is where those aforementioned gliders come into play. Automatically deployed once you reach a certain altitude, the kart's glider lets you take to the skies. It's a little tricky to get used to, as the controls are a bit touchy, but if you time it right, you can sail over racers' heads. To call Mario Kart 7 highly anticipated would be a huge understatement. Every 3DS owner wants a copy, now more than ever with the recent news of online play over WiFi. The temptation to play "just one more race" has always made Mario Kart a surefire hit with anyone looking for a fun time, and Mario Kart 7 is no exception. We can't wait for December 4.